Steam potatoes for 20-25 minutes in a large covered pot with ½" of water. Cut potatoes in half. Do not peel. Heat 1 Tbsp. oil in a medium skillet. Add ham, walnuts, and garlic. Sauté 10 minutes. Add sherry or white balsamic vinegar, stir well. Combine ham mixture with potatoes, remaining 2 Tbsp. of oil, bell peppers, green onions, salt and pepper in a large bowl. Serve warm or cold with steak, burgers, chicken or fish. 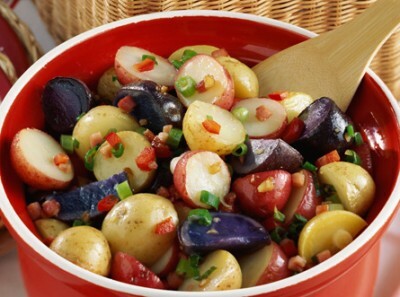 Microwave option: Use Simply Spuds™ Steamables™ in lieu of Side Delights™ Gourmet Petite Potatoes.